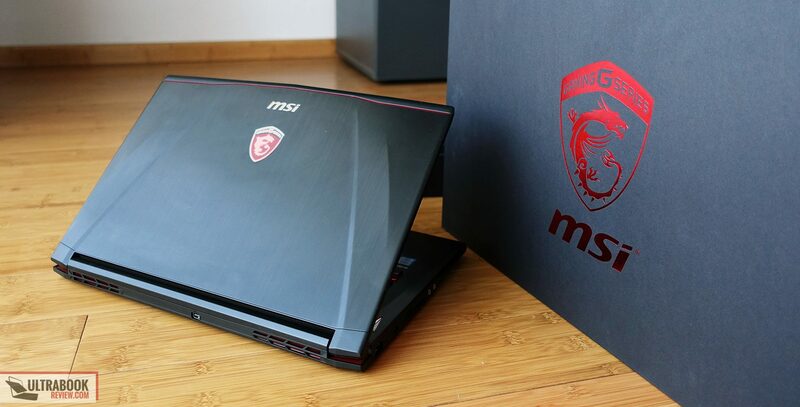 Summary: The MSI GS43 is an ultraportable gaming laptop to consider if you absolutely must have powerful specs in a compact enclosure, cause otherwise squeezing high-performance hardware in a tight case leads to high temperatures under load and a noisy cooling system. On top of these, this 14-inch laptop doesn't get the same speakers, keyboard or screen options as the 15 and 17-inch ultraportables in MSI's current listing, and personally I'm not convinced these are worth sacrificing just for the sake of the more compact footprint and lower price. Read the full review below for the whole story. 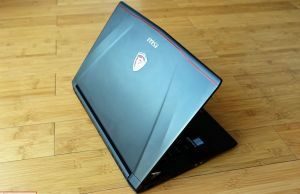 The MSI Phantom GS40 was one of the most appreciated gaming ultraportables available in the last years, mainly because it was more affordable than the competition and managed to deliver solid gaming experience in a compact package. Buyers enjoyed it, that’s why it actually got solid user reviews throughout its lifespan, despite its flaws, mentioned in our review. 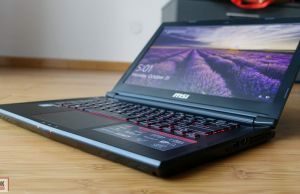 As of the second half of 2016 the GS40 was replaced with the GS43VR Phantom Pro, which is pretty much the same device in terms of construction and features, but with an Nvidia GTX 1060 graphics chip inside and slightly faster memory and SSD storage. 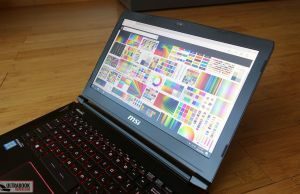 I’ve spent the last two weeks with the MSI GS43VR and I’ve gathered my impressions in this article. 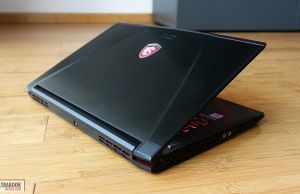 This is the first time I’m actually reviewing an MSI notebook in many years, as Derek is our MSI enthusiast here on the site and usually writes about their products, but I was looking forward to find out how I feel about these laptops. 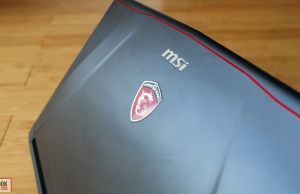 The tested unit was sent over by MSI Europe for the purpose of this review and was returned shortly after publishing the post. 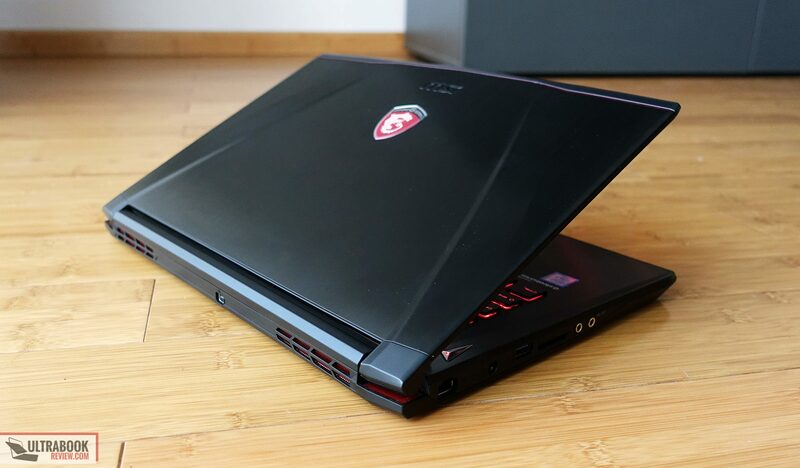 In very few words, the MSI GS43VR delivers solid performance in daily use and games, running most titles at above 60 fps on 1080p resolutions and high details. 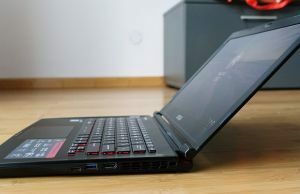 However, as expected when you squeeze powerful hardware in a compact body, it runs hotter and noisier than other gaming ultraportables like MSI’s GS63 or GS73. 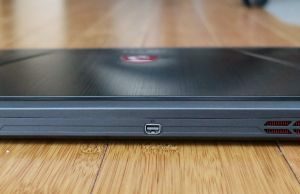 These are trade-offs you just have to accept when going for the smaller form factor, but there are a few more aspects you have to consider before deciding if this is the right laptop for you or not, and we’ll cover them all in the article below. 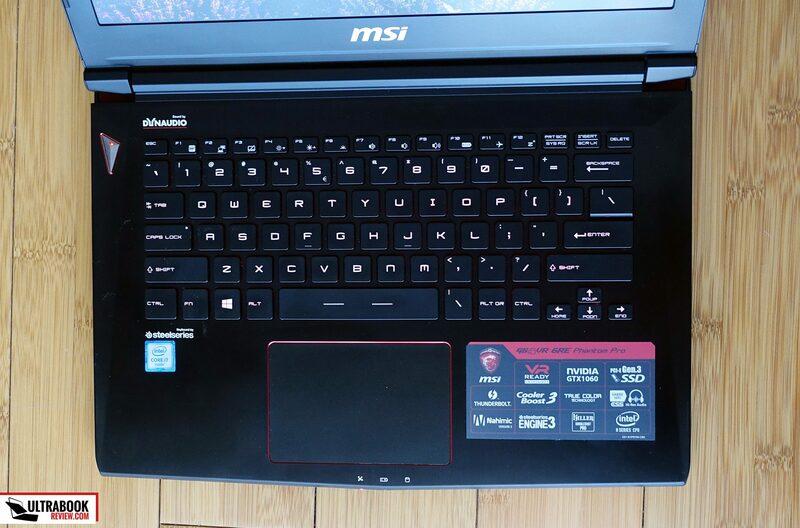 On the outside the MSI GS43 is similar to the GS40. I like the way it looks and after using it for a while, I also think it feels competent as a mobile power-horse, but you do have to be aware that it’s not a very robustly built computer. 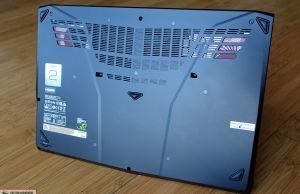 MSI use plastic for the internal chassis and sides, and the bottom is also made from a thin and flexible sheet of plastic. The back gives in a little bit when grabbing the laptop, especially towards the upper part where all those air intake grills are placed. The bottom is also made from simple smooth plastic, without the layer of felt on top that’s available on the GS63s and GS73s, which actually conceals the flex and has a role in isolating your legs from the hot internals and case on the larger units. While the bottom is made of plastic, the lid and the interior are mostly covered in brushed metal, but there’s some flex here as well as the sheets of aluminum they’re using are really thin. 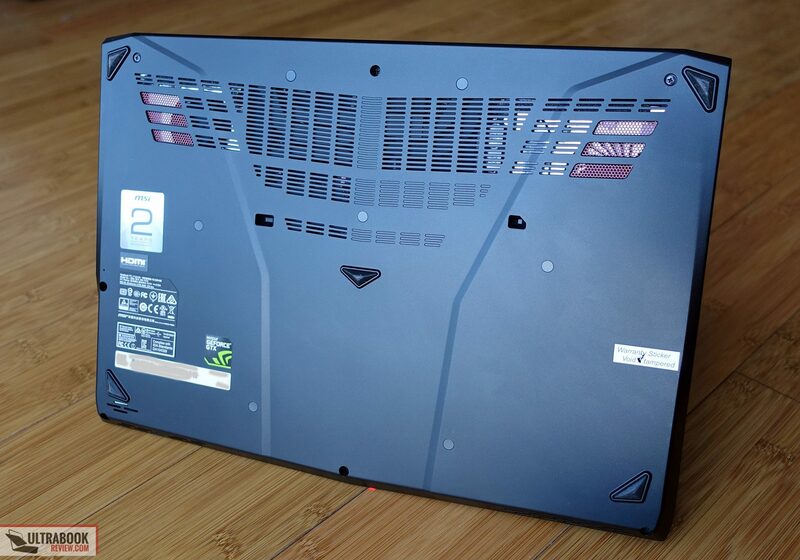 I reckon MSI built the case this way in order to save up weight and costs, to some extent. Now, you shouldn’t understand this is a poorly made device, that’s not the case. It’s just not as solid as I’d expect from a gaming machine, which means that if you end up buying one of these you should treat it nicely and pay attention to how you’re carrying it in your backpack or bag. Sturdiness aside though, I have nothing to complain about the build or finishing quality. There’s a lot of attention put into details and how the plastic and metallic elements bind together. For example, the lid is mostly metallic, but its upper part (hiding the wireless antennae) and lower part (that includes the hinges) are made of plastic. The lid also gets some creases, the MSI logo and dragon shield in the middle. 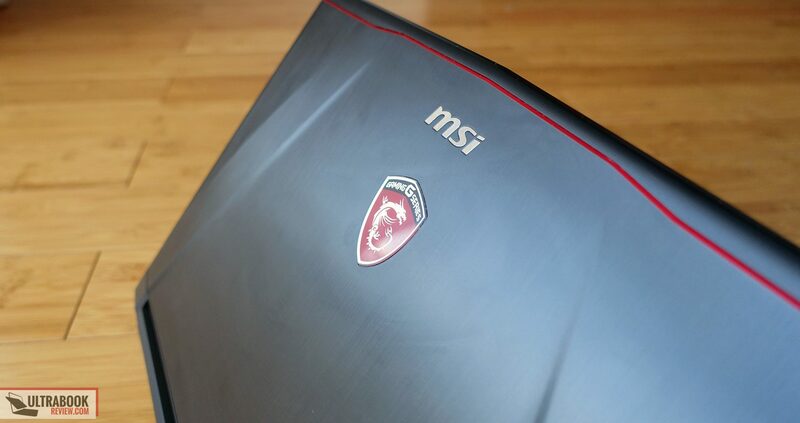 Derek rants about this logo in all his MSI reviews and I understand why, it sticks outs, is backlit by the panel (which means the illumination can’t be switched off and it will vary in intensity based to the screen’s set brightness), and is a little indented as well, so you can’t really cover it with a skin or decal, which pretty much ruins the GS43 for professional environments where such flashy design elements are not accepted. 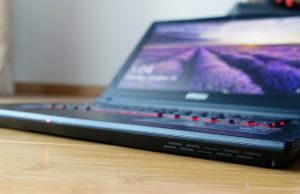 On the other hand, I did see much more obtrusive designs on other gaming laptops from Asus or Acer, cause with the exception of this shield the GS43 gets a pretty tamed down design, mostly black with only a few red accents on the lid, the exhaust grills and around the trackpad and power button. The black aluminum on the lid and interior does show smudges, fingerprints and sweat marks very easily, so you’ll have a hard time keeping this clean, but it’s nothing a piece of soft cloth and some rubbing can’t handle. 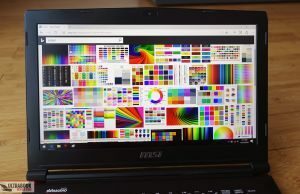 Let’s turn our attention to how this laptop feels in daily use. It’s a little thicker and heavier than other 14-inchers. MSI claims it weighs 3.95 lbs, but my scales are showing 4.1 lbs for the tested configuration and the height is around 0.9″. Still, considering the hardware inside, I think this is compact enough and you shouldn’t have any issues grabbing and carrying it around. The screen lifts with a single hand and the hinges seem pretty well made, but they could be a little stiffer, as they give in and the screen changes its inclination when for instance you’re picking up the laptop from a desk in order to take it to another place. That’s rather insignificant though, what actually bothers me about the hinges is the screen’s inclination angle of around 135-140 degrees. 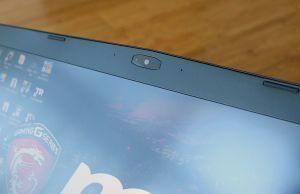 The hinges’ design would have allowed the display to lean back flat with the right internal mechanism, yet MSI chose not to. As it is right now, the angle is large enough for desk use, but limiting for lap or couch use. Opening the lid reveals a fairly roomy interior. The main deck is covered in the dark brushed aluminum I mentioned earlier, with a slightly recessed keyboard in the middle, the trackpad beneath and the power button on the left. You’ll notice there are some stickers on the arm-rest, but you can peel them off easily. There are also more stickers on the back, including one on top of a screw that says it would void warranty if tampered. Derek says MSI North America allows users to get inside the laptop without voiding warranty and I’ve contacted MSI Europe and asked about their policy over here. 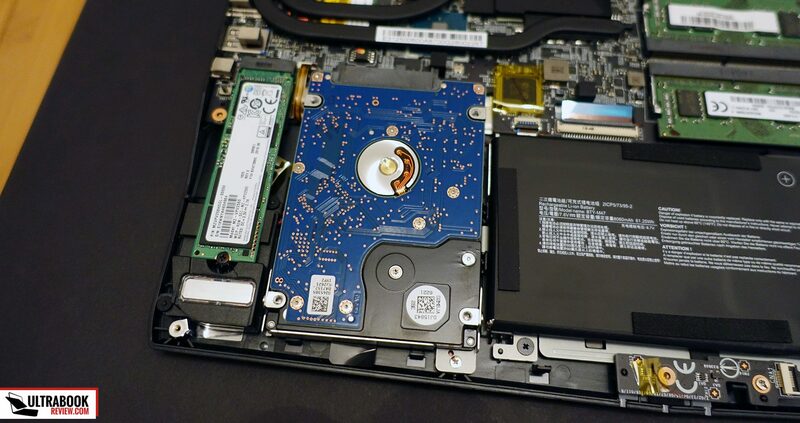 They replied that users can get inside the laptop and upgrade it without voiding warranty, but of course if they break something during the process that’s not going to be covered by warranty. So make sure you know what you’re doing! Aside from the stickers, the belly includes five small, but soft and grippy rubber feet, and most of its upper part consists of air intake grills, with red meshes on top of the two cooling fans and the exhausts placed on the back and lateral edges. Back to the power button, it looks funky and is constantly backlit by and LED that also acts as an indicator to which GPU is used at a given time. It glows red when the device runs on the integrated Intel chip and orange when it switches to the Nvidia chip, although it’s not always easy to tell them apart. It’s not very bright and I like that, but I still find it a little annoying when watching a movie in a dark room and would have preferred to have the option to switch if off completely. The IO is lined on the sides and nothing has changed over the MSI GS40. There’s a miniDP port on the back and some status LEDs on the front, while all the other connectors are lined on the edges, as you can see below. 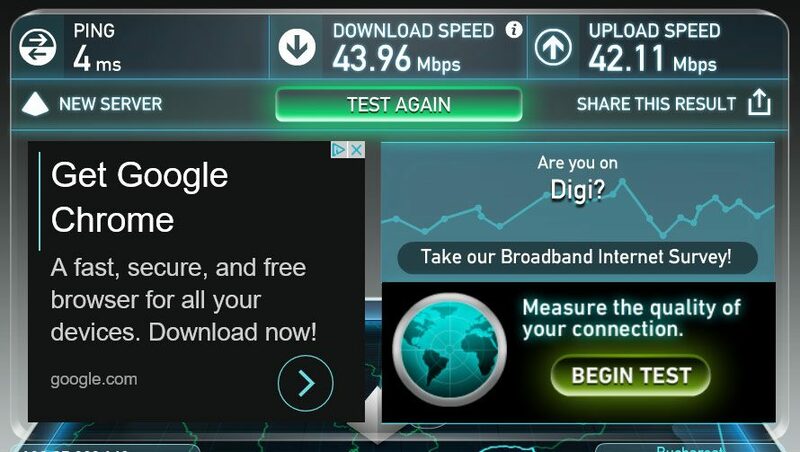 You only get two USB 3.0 ports, which might not suffice for some of you, and the SD card-reader is slow. The HDMI and Thunderbolt 3 ports are placed on the right side, just in the middle of the laptop, as the top is reserved for cooling grills. That’s means if you’re a righty and plan to use a mouse you’ll have cables in your way when hooking up peripherals to these ports, and this unfortunately is an issue with all the slim MSI series. 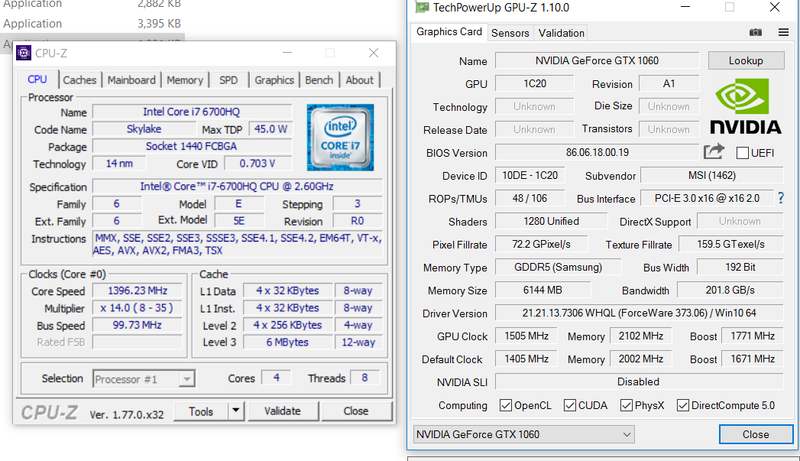 I don’t have a Razer Core or other TB3 external GPU enclosures to test, but Derek did test the GS63 and GS73 with his Core and I also know the GS40 is compatible with the Core as well, so the GS43 should work fine as well. 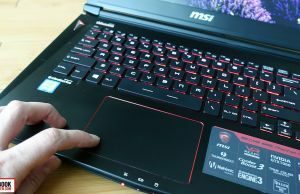 I was actually looking forward to test on these MSI SteelSeries branded keyboards after reading Derek’s praises in his articles, but this one on the GS43 is their best implementation. 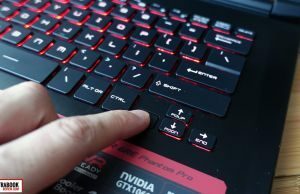 In fact, it’s similar to the keyboard the GS40 and not the variant present on the GS63 and GS73, and Derek mentioned it feels different in his review of the GS40. 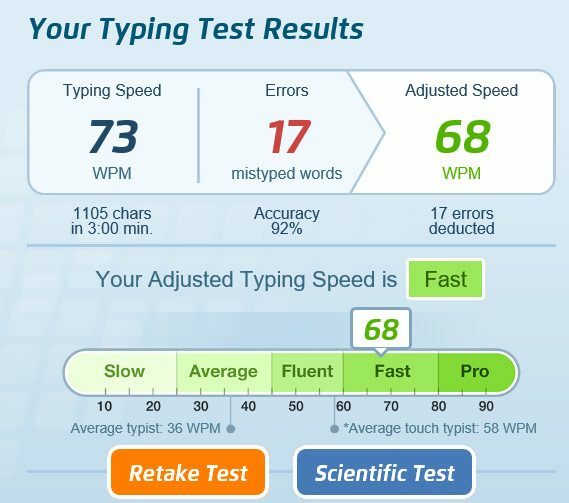 I’ve typed a few thousands of words on this keyboard and I can conclude it’s not down my alley, but it’s definitely not horrible either. The layout is pretty standard, nothing to complain about this, and the keys are properly sized and spaced. 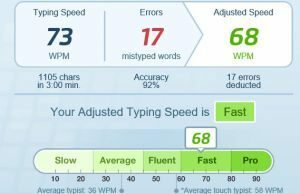 However, I feel they should pose more resistance, as they are a little shallow, just too quick to depress and too quick to register hits, which pretty much translates in a higher amount of typos and missed strokes. I was hoping I’d adapt to the feedback after a while, but my accuracy didn’t improve much after two weeks of use. 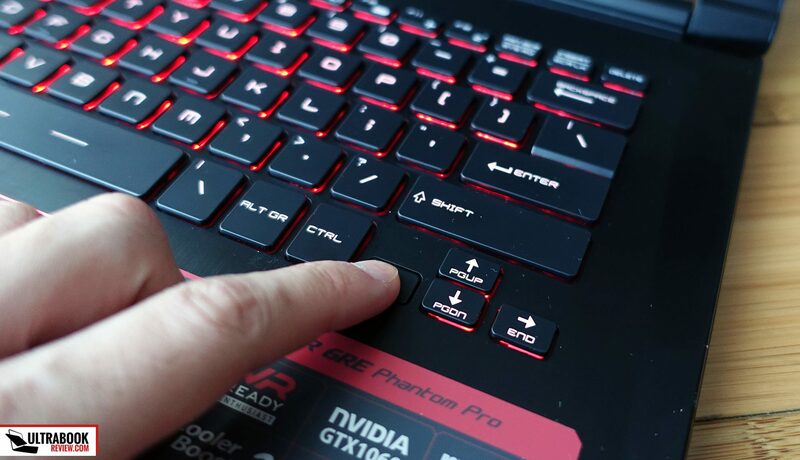 The keys are backlit and you can choose between two levels of red illumination or turn the back-lightning off, but they do not get multicolored LEDs like on the larger MSI gaming laptops. 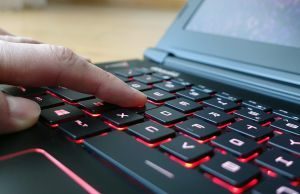 The illumination is evenly spread across the entire keyboard, but because the keys have a pretty high stroke for an ultraportable, you can see the red light creeping from under the keys at certain angles, including when the laptop sits on a normal desk. That didn’t actually bother me, but is something to keep in mind. One other aspect I should mention here is the font MSI uses for the writing on the keys, which is a bit unusual, futuristic. I personally got used to it, but some of you might not like it that much, just check out the pictures to know what to expect. 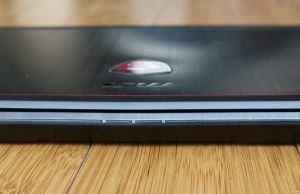 The trackpad sits beneath the keyboard and is slightly depressed into the chassis and framed by a red beveled edge, which looks nice and makes it easy to find in the dark. It’s a plastic Elan Pad surface and it performed mostly fine with daily use, but I did run into a few issues. First of all, the two-finger tap for right click isn’t activated by default, so you need to go to the settings and select Pop-up Menu as the action for two-finger taps, which I actually had to look for on the Internet cause Pop-up Menu doesn’t sound like Right click at all for me. Still, that’s not much once you know how to fix it. What bothered me more is the occasional stuttering and lack of response I encountered with basic gestures and swipes, corroborated with a short and loud beeping when the stuttering occurred. I’ve looked into this, as quite a lot of buyers are complaining about it on Amazon and the forums, and it looks it’s mostly a software issue and not something related to the trackpad per se, we’ll talk more about it in the next section. 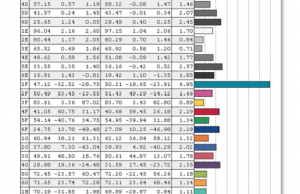 One final aspect to mention are the physical clicks, which are stiff and fairly noisy. They require quite a lot of force to press, to the point the arm-rest starts to flex and the screen wobbles by the time you actually get these buttons to register a command. They might give in in time, but if you’re actually using them instead of taps, the out of the box experience isn’t great. 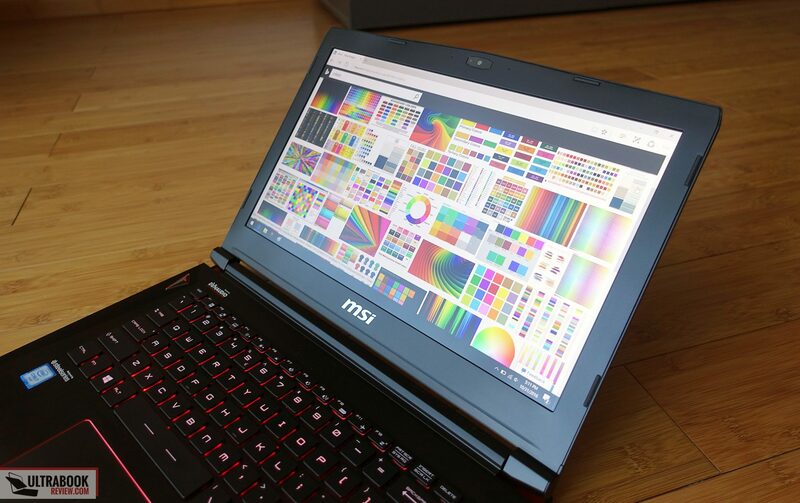 MSI puts a matte 14-inch screen on the GS43 with a FHD IPS panel. 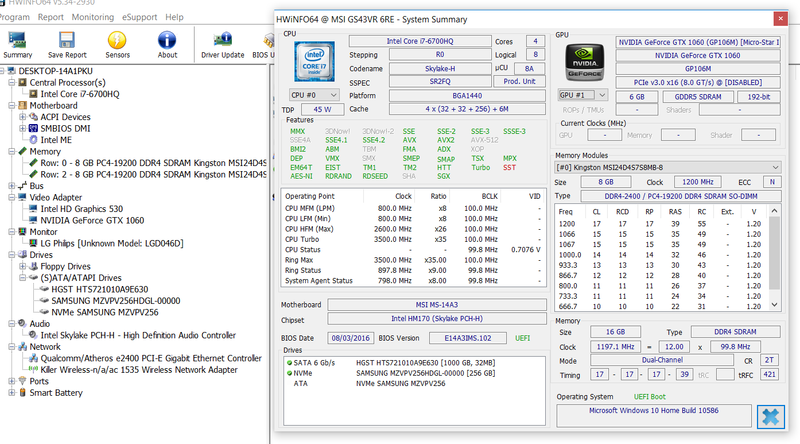 It’s a 60 Hz screen without GSync support, as Nvidia Optimus is present on this computer, and this is the only display variant available, unlike with the 15 and 17 inchers where multiple screen options are offered. The panel is overall pretty good though, with excellent contrast, wide viewing angles, decent brightness and color coverage. 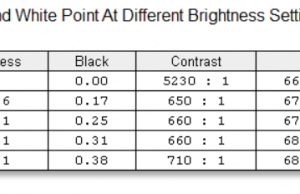 I’m saying decent brightness because it’s only only good enough if you plan to keep the computer indoors, otherwise at only around 270 nits it won’t suffice for outdoor or bright environments use. On the other hand, the minimum brightness setting is very low, which is nice for those of you that like to use the computer in the dark without an ambient light source (albeit that’s not recommended). 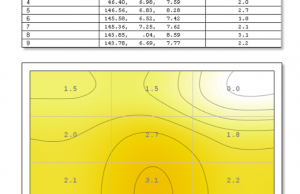 That aside, this panel is not the best fit for graphics professionals or the purists among you either, as its color accuracy is only average, but you can calibrate it to some extent or use our ICC profile available over here. You’ll find more details below, taken with a Spyder4 Elite. 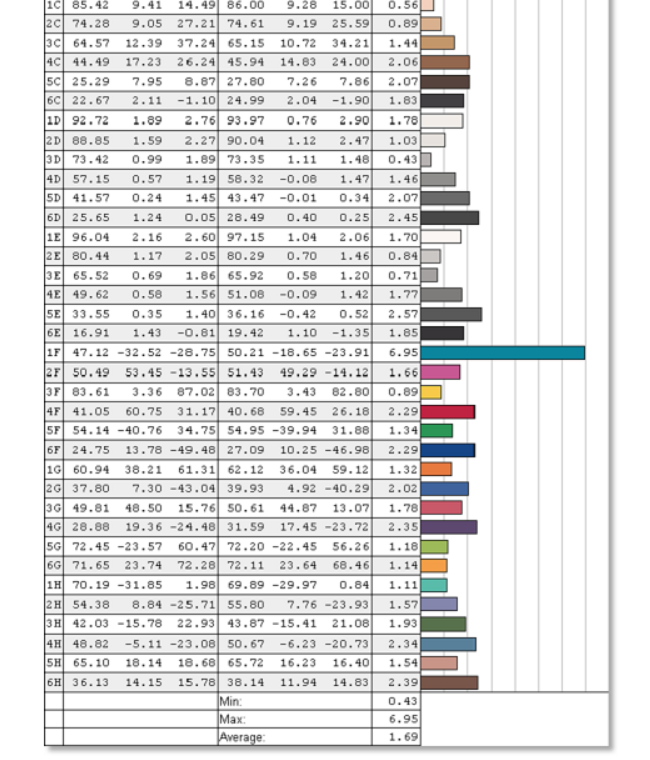 Average DeltaE: 1.78 uncalibrated, 1.69 calibrated. As for the resolution, at 1920 x 1080 px it’s not the sharpest out there, but it’s sharp enough not to distinguish individual pixels (I’m scaling everything to 125% from Windows) from normal viewing distance and I also think this panel is a fair match for the hardware inside, allowing almost every game to run with high details at 1080p. 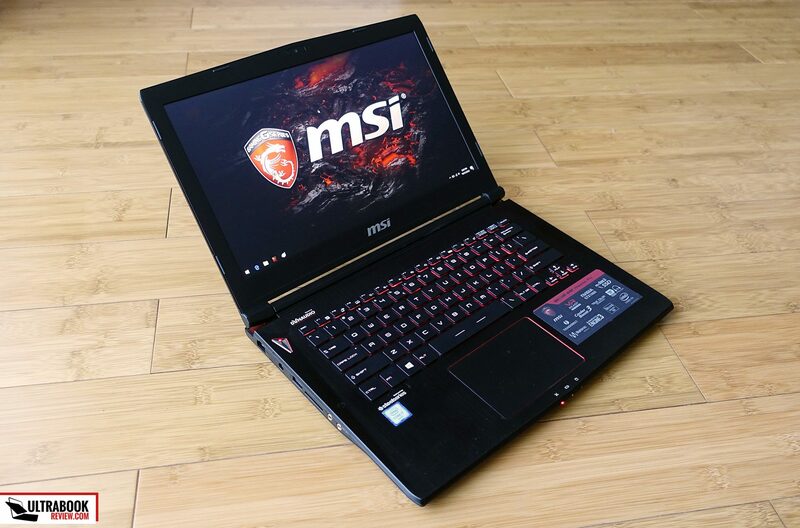 We tested a high end configuration of the MSI GS43 here that includes a Core i7-6700HQ processor, 16 GB of RAM, the Nvidia GTX 1060 dedicated graphics (with Optimus and Intel HD 530) and dual storage, with an M.2 NVMe drive for the OS and a 2.5″ 7200 rpm HDD for mass storage. 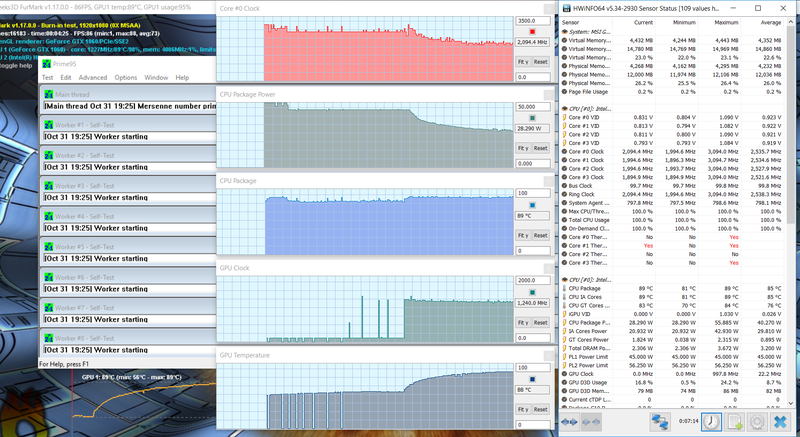 The CPU and GPU are standard on all configurations, yet the amount of RAM and storage types varies. 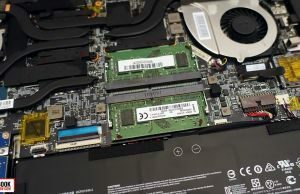 The laptop can take up to 32 GB of RAM in its two available DIMMs and the basic configurations are available with SATA M.2 SSDs. 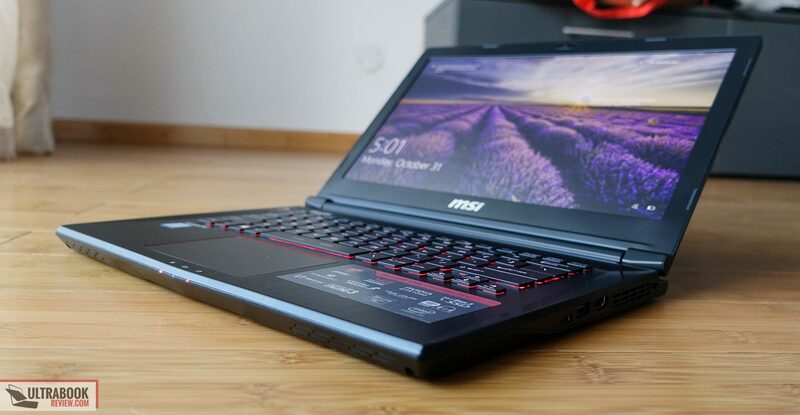 Compared to the MSI GS40 we reviewed last year, the newer GS43 is equipped with faster DDR4 2400 MHz memory, an NVMe SSD (on this model) and the Nvidia chip, which is the big novelty here. 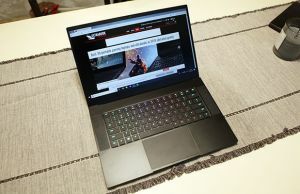 The GS43 gets the same 1060 with 6 GB of VRAM that’s also available on the 15 and 17-inch Phantom Pro models, as well as on the main competitors: the Razer Blade 14 and Gigabyte Aero 14. 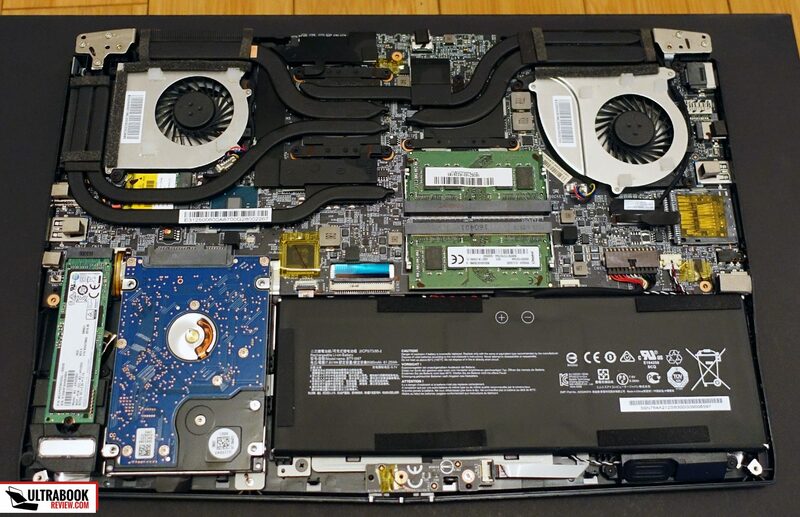 The RAM and the storage are upgradeable on this laptop, and getting inside is a fairly easy task, you just have to remove the back panel that’s hold in place by a handful of Philips screws. 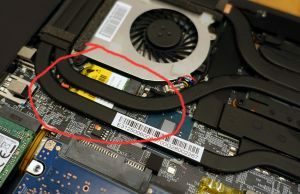 There’s a warranty sticker that says “void if tampered” on top of one of the screws, but according to MSI, US and European customers (not sure about other regions) are allowed to break the seal without voiding warranty, but if you’ll break anything while inside that’s not covered by warranty. 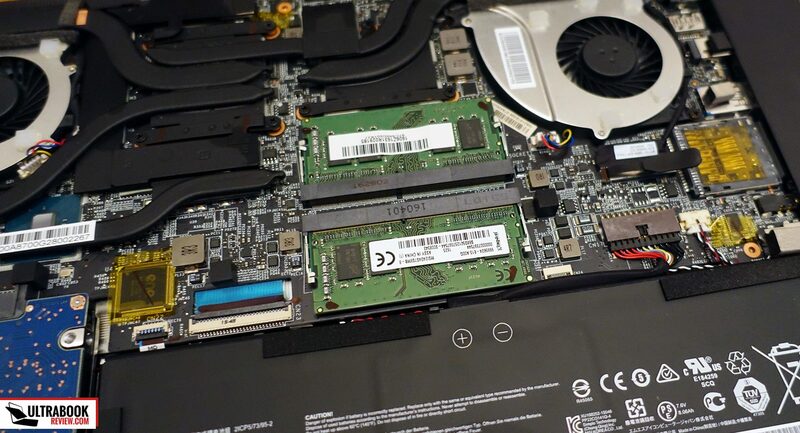 Once you get inside you’ll notice that the M.2 SSD, the 2.5″ bay and the two RAM slots are easily accessible. The only components that’s more difficult to get to is the wireless chip, which is placed underneath one of the cooling heat-pipes and you’d have to remove the entire cooling system if you want to get to it, which I wouldn’t recommend unless you really know what you’re doing. 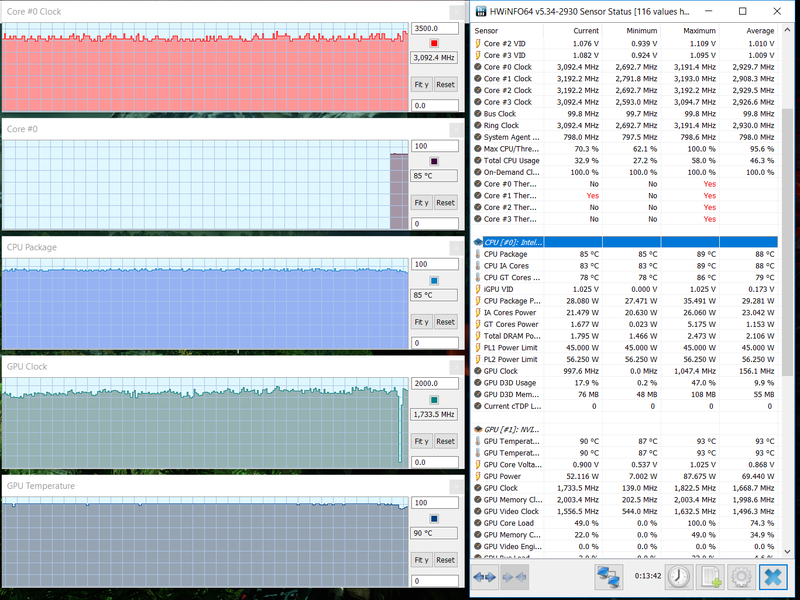 Anyway, let’s get to how the GS43 performs and feels in daily use. 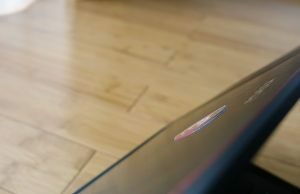 With the kind of hardware mentioned above, I was expecting it to fly, but the out of the box I experienced sluggishness and micro-stuttering with even the most basic tasks. 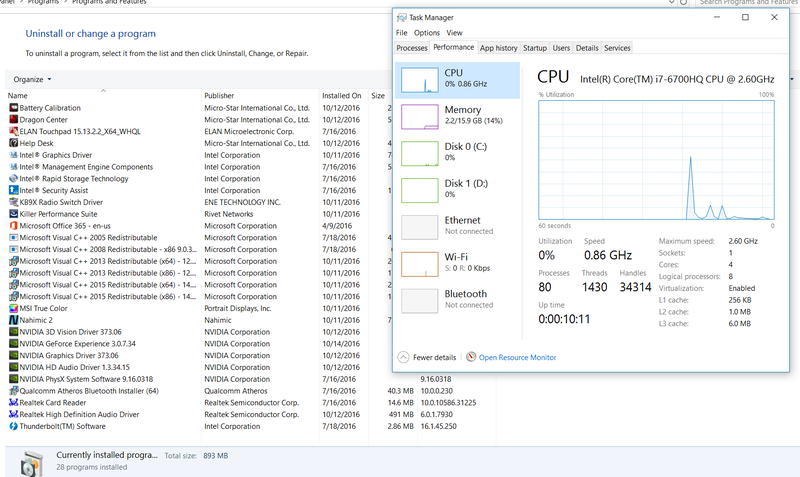 Once I started investigating I realized that both the SSD and the processor where running at 100% all the time and Google unveiled that is actually a “feature” according to MSI, meant to keep Windows from entering a low power state and improve transfer speeds over SATA and USB. 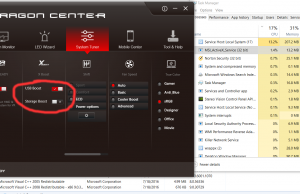 I’m not even going to comment on this, all I’d say is at least it could be switched off by default in Dragon Center (it’s the X-Boost options under System Tuner, as you can see in the pics below) and only activated if the user so desires. 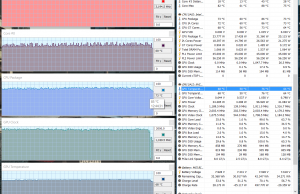 However, toggling these OFF did not fix the stuttering, but improved the overall performance. 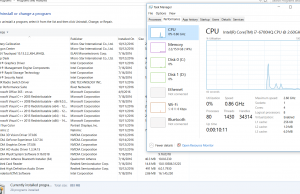 And since we’re here, MSI simply loads this computer with a huge amount of crapware. Derek actually told me the first thing he does on an MSI laptop is do a clean Windows install, and I really recommend you to do it as well, as I’ve seen people claiming they were able to address the micro-stuttering this way, without installing any of the MSI software afterwards except for Nahmic, which you’ll need to get half-decent sound, as you’ll see below. 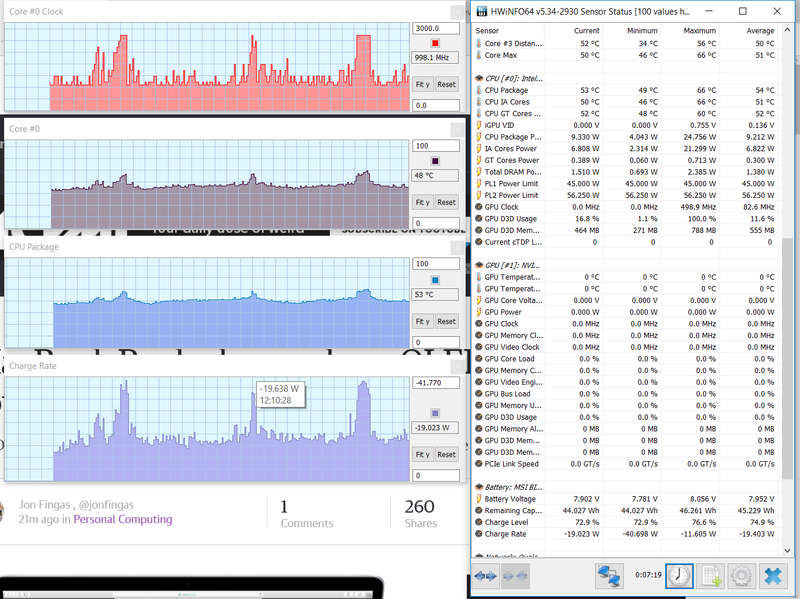 This micro-stuttering is what I believe causes the trackpad freezes and beep noises that I mentioned before. 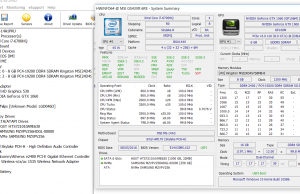 Still, other users claim the stuttering is still there with a clean Windows and is caused by the Optimus implementation with Nvidia Pascal chips, and that means only a BIOS update from MSI could address it. Bottom point, I’d still install a fresh copy of Windows as soon as I’d take this laptop out of the box. I didn’t do it on this test unit, so the rest of my conclusions are based on the default Windows install with most of the bundled crap uninstalled manually. Except for the occasional stuttering, the GS43 had no issues handling every sorts of daily tasks, from browsing to watching video content and editing documents. However, I did notice that the Balanced profile is a little aggressive and sometimes keeps the CPU running at higher speeds than it should, which takes a toll on battery life. Switching to Power Saving helped, but the behavior on Balanced actually improved after Windows updated to the Anniversary Edition package. 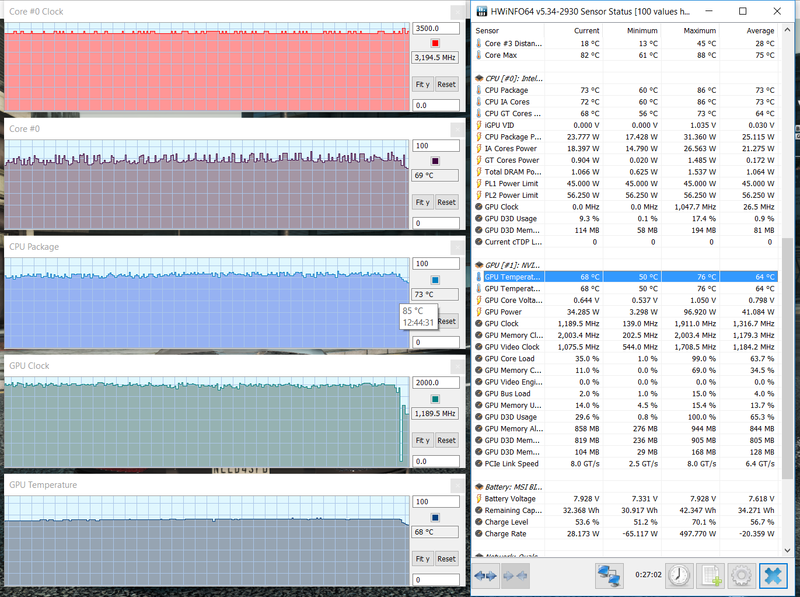 Performance under load is solid on the GS43, both in games and in benchmarks. I’ve added some numbers below and they’re similar to the ones we got on the MSI GS63 and GS73, all three laptops being built on the same hardware platform, but with different cooling solutions. 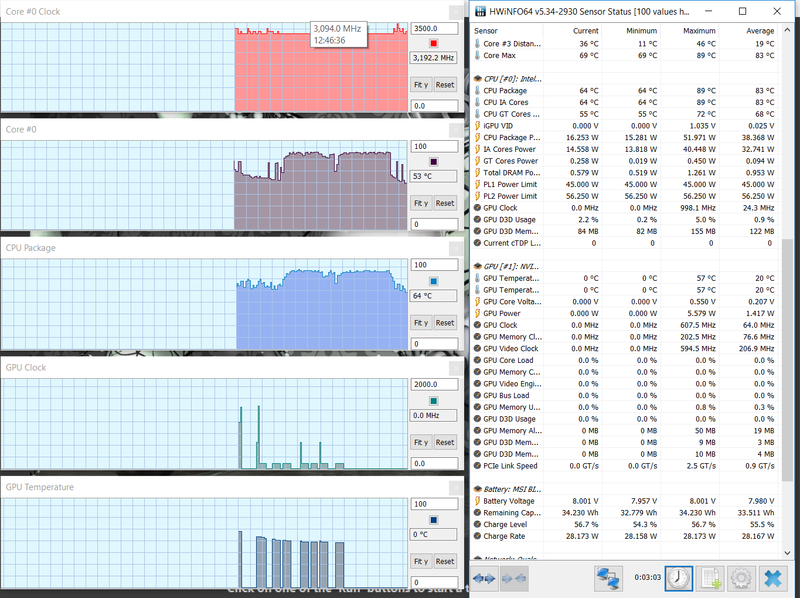 x264 HD Benchmark 5.1 64-bit: Pass 1 – 66.44 fps, Pass 2 – 14.34 fps. 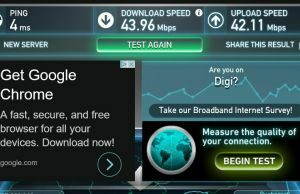 I’ve also tried a few games on the GS43 at Ultra and High details on the default 1080p resolution and all were able to run flawlessly while the computer was plugged in. 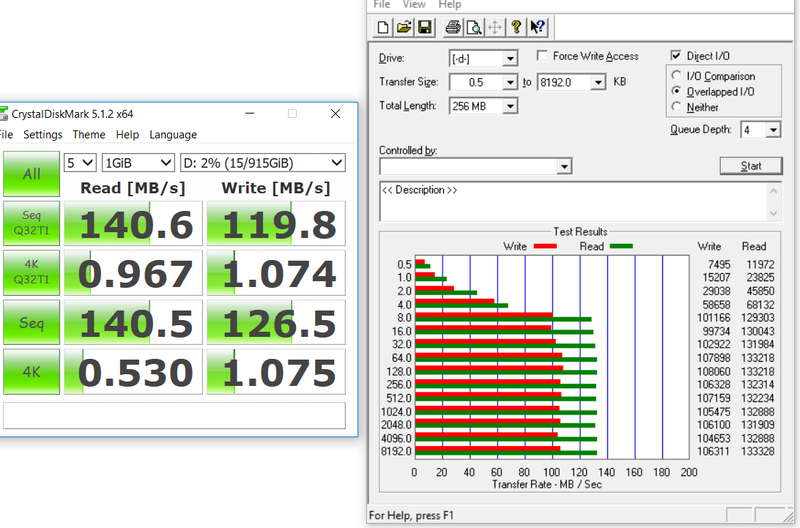 Unfortunately I don’t own the titles Derek tested in his reviews of the GS63 and GS73 for comparison, but based on the results below and the benchmarks scores, I expect the GS43 to match those in every case, as performance under load is indeed one of its strong suits. 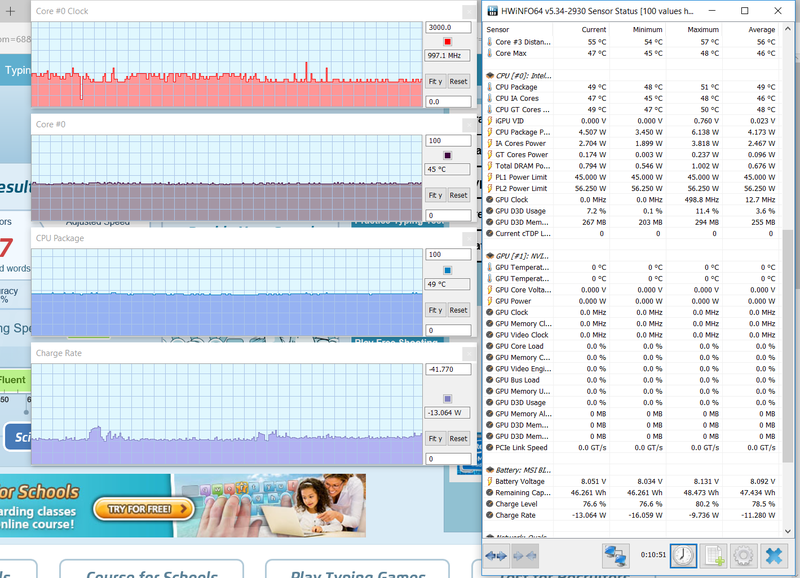 While unplugged I got some erratic results though. 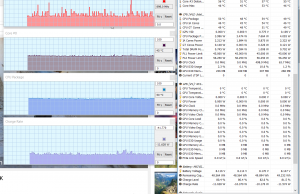 In some titles I was able to get a constant gaming experience for a longer period of time, but the GPU only ran at about half its normal speed, while the CPU showed no throttling signs. 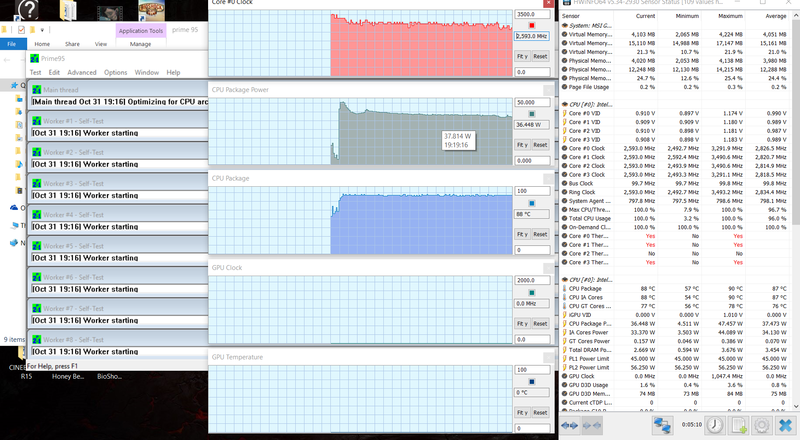 In others the GPU would run at nominal speeds for about a minute and then dropped to very low frequencies. 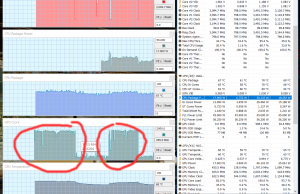 Plugging the laptop back in would make the GPU get back to its normal frequencies for another minute, and then it would again drop to abysmal levels and I for one can’t find a clear explanation for this behavior. 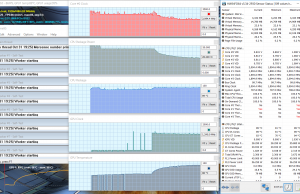 So in conclusion, gaming on battery is problematic on the GS43, at least based on my experience. 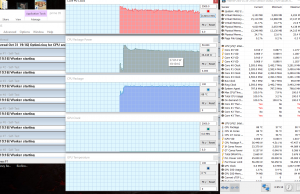 I’ve also put the GS43 through the standard stress test, pushing the CPU with Prime 95 and then the CPU and the GPU (with Furmark) at the same time. 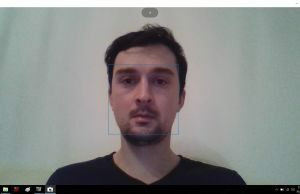 You’ll find the results in the pictures below and they’re not unexpected from such a computer. 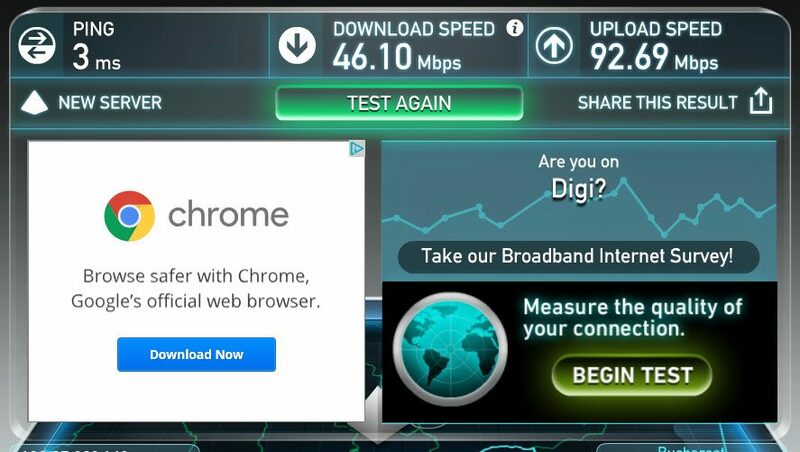 The good news is there’s no throttling in daily use though, which is what actually matters. This laptop is never quiet. It gets two fans inside, but they aren’t actually active with very basic activities, however you’ll still hear the mechanical HDD’s constant hum, that’s why I suggest replacing it with an SSD. 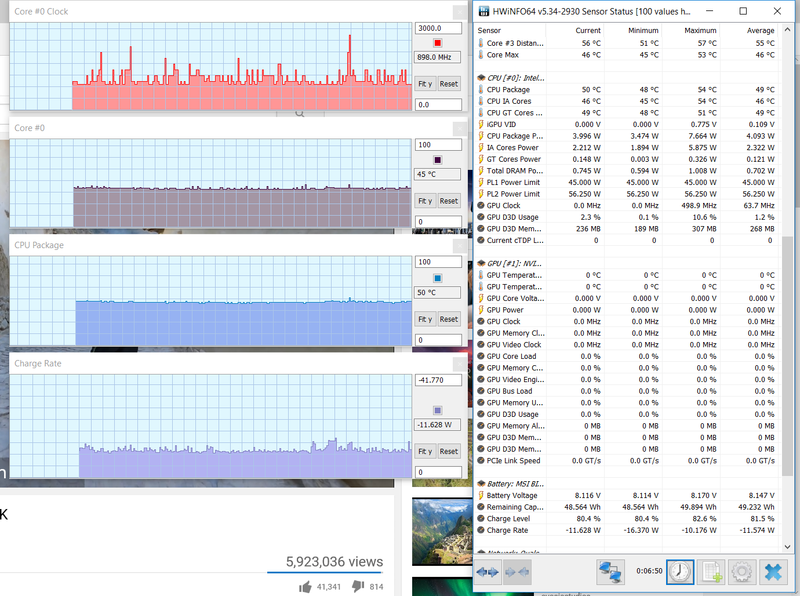 The CPU fan starts spinning once you launch a few programs, while the GPU fan remains mostly idle, but even in this case the HDD’s noise is dominating, so you could get a pleasant experience with daily use if you upgrade it to an SSD and use the Power Saving mode in Windows, as the Balanced mode doesn’t always work as it should. The multimedia results below are recorded on Balanced mode, so expect the temperatures to be a little lower with Power Saving. 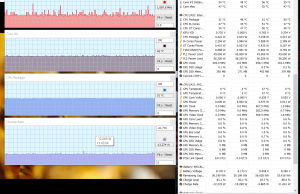 Once you load games and other demanding apps that put the CPU and GPU to work you’ll immediately start hearing the two fans. They just need to spin fast in order to cool this kind of the hardware in compact case, and as a result are some of the loudest I’ve seen on any laptop in the last years, going up to 54 dB at head-level (measured with my iPhone app, idle noise at 38 dB, ambient at 33 dB according to the same app), which means you’ll pretty much have to use headphones to cover them up, especially with the poor speakers this laptop gets. 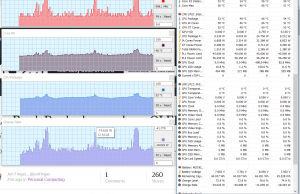 Some people complain about the fans pulsating and I did notice this with medium multitasking on our review sample, but it’s not something that really bothered me. On top of that, despite the noise, the internals and the case get really hot, with certain surfaces on the back going past the 60 degrees Celsius point. I was expecting high temperatures, but these are higher than what Derek measured on the GS40 or the GS63, which is probably because we’re using different thermometers. 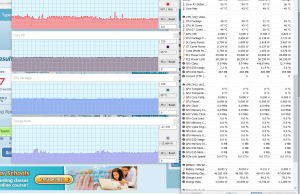 At the end of the day though, you don’t really need a thermometer to tell that this laptop gets very hot and noisy under load. 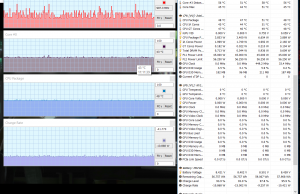 There are some ways to lower these temperatures (there’s a guide here) and among them I’d suggest using a cooling pad or repasting the CPU and GPU. This usually helps, but I couldn’t do it on the test sample. Connectivity wise there’s Wireless AC, Gigabit LAN and Bluetooth 4.1 on this computer. 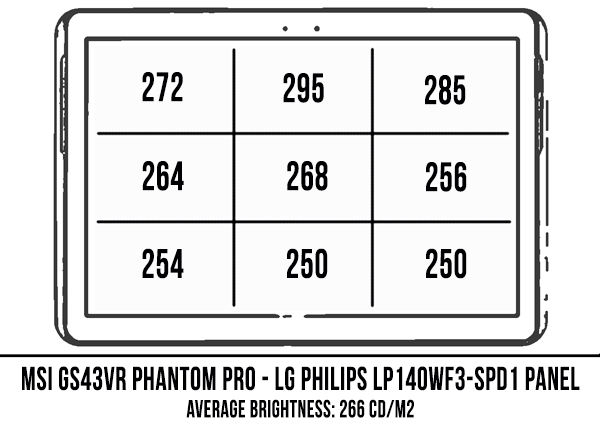 MSI puts the same Killer N1535 module on the GS43 as on their larger Phantom Pros and it’s a capable solution, providing solid performance and signal strength both near the router and at 30 feet with 2 walls in between in my house. 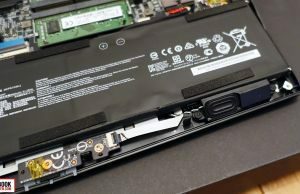 I haven’t ran into any issues, drops or disconnects during the two weeks I’ve used this laptop and Derek praised the Killer module in his reviews of the GS63 and GS73 as well. However, I’ve seen some people complaining about it on the forums and suggesting it’s better to replace it with Intel WiFi chips, but like I said, I didn’t run into any issues on this review unit. Also, getting to that Wi-Fi chip is complicated, since it’s placed underneath a heat-pipe, as mentioned earlier. 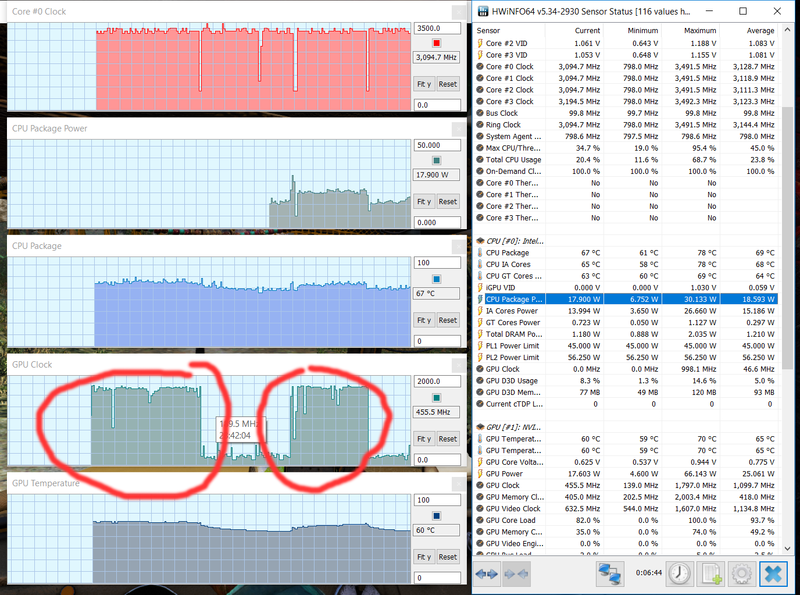 When it comes to the audio on the GS43, MSI unfortunately stuck to the awful solution of the GS40. The design might make you think there are two speakers om this computer, but once you get inside you’ll notice there’s a single one placed towards the right speaker cut. Sound fires through the grills on the front-lip and its moderately loud, peaking at 87 dB in our tests, but at levels above 70% you’ll start noticing distortions and cracking. 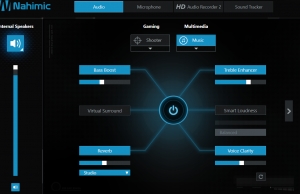 Even at lower volumes, the sound quality is poor and tweaking the settings in the included Nahimic Audio software that comes included makes only a small difference, but enough to justify keeping the software installed. On the other hand, the audio jack is decent and that leaves you the option to turn to headphones for sound. 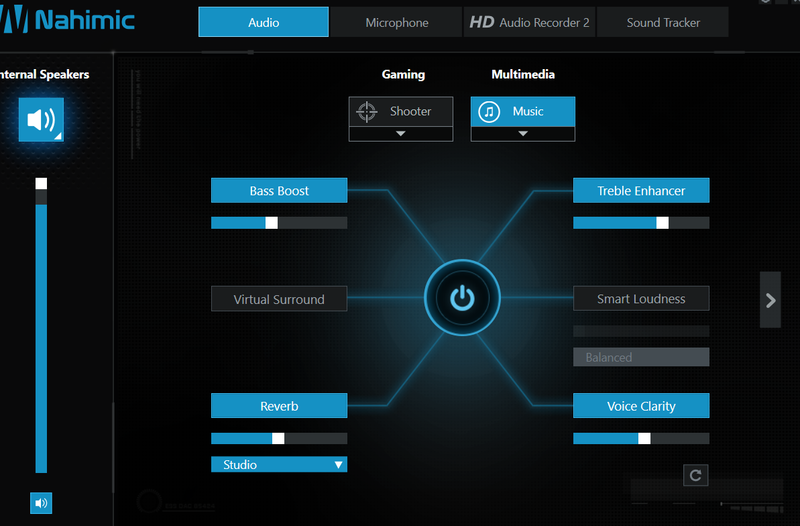 In fact, you’ll pretty much have to if you care about audio quality. 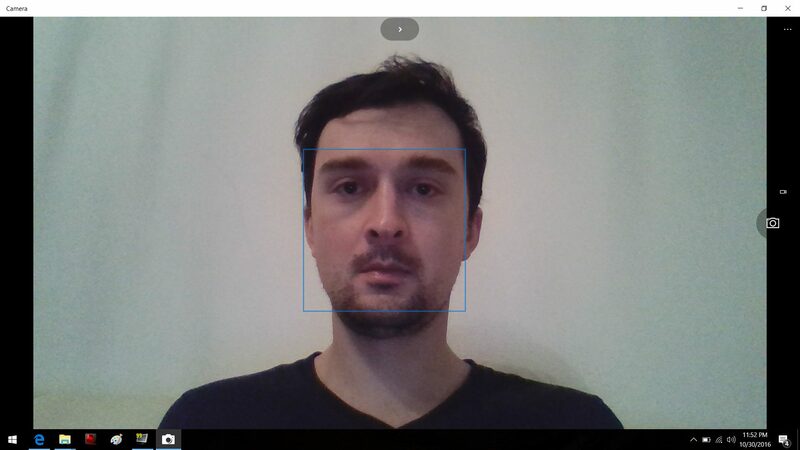 Last in this section is the webcam, which I think it’s pretty decent, both in good and in poor light. The pic above is captured in a dim room and while there’s graininess, the colors and details aren’t bad. The mics do a decent job at capturing voices as well, so this combo will do fine for occasional Skype or Hangout calls. 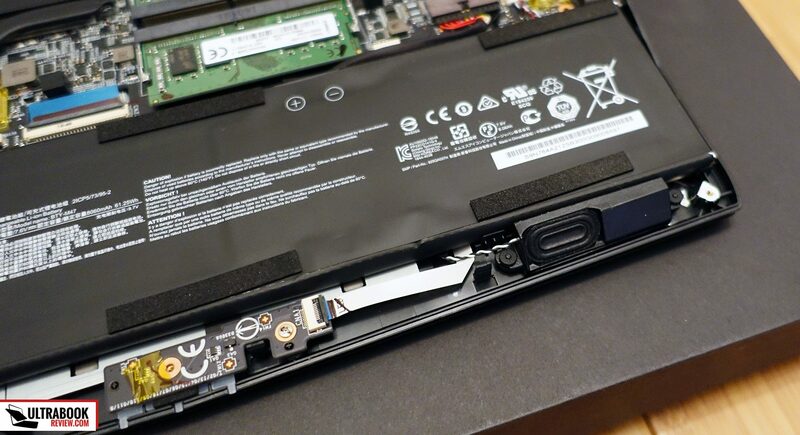 The GS43 gets a 61 Wh battery, which is actually bigger than the battery on the GS63, and this allows some decent results in daily activities. I’ve listed what to expect below, and the screen’s brightness was set at 40% brightness, which is roughly 120 nits. 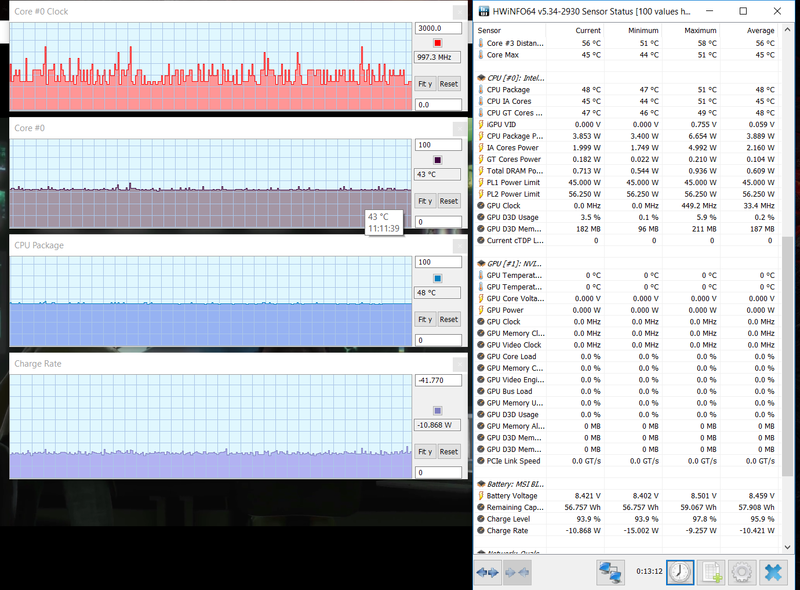 50 W (~ 1 h 10 min of use) – heavy gaming in 1080p, Balanced Mode, screen at 40%, Wi-Fi ON. 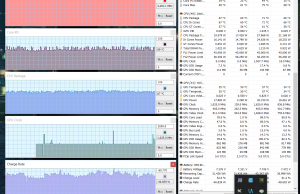 If you’re not getting similar results, try to switch to Power Saving instead, it’s not going to impact performance with daily tasks and it will force the CPU’s frequency down. The laptop comes with a 180 W charger that weighs about 1.5 lbs and a full recharge takes between 2 and 3 hours, based on what you’re doing on it during this time. As Derek mentioned in his review, this 180 W brick is smaller than the 150 W bricks MSI used on their previous gaming series, but is still bulkier and heavier than the power brick on the Razer Blade, which means there are ways to make it even smaller. Normally I wouldn’t even mention this, but this detail actually matters on an ultra-portable. 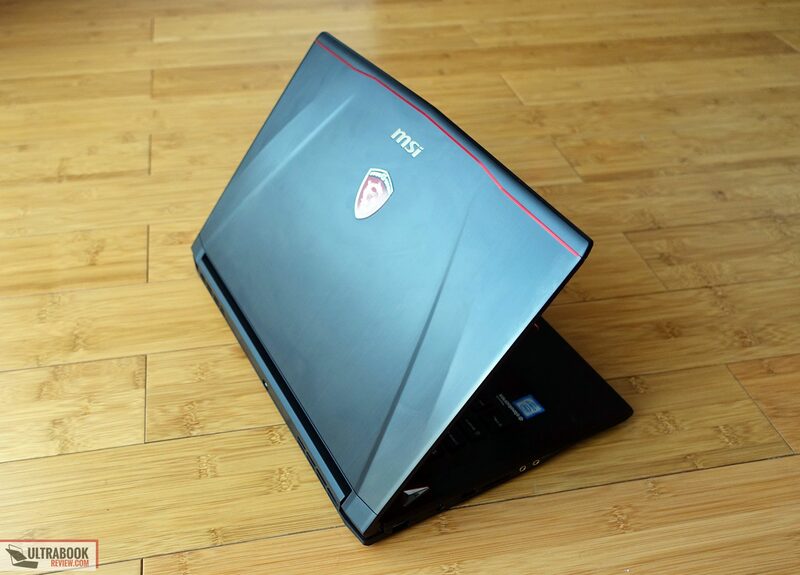 The MSI GS43 is available in stores around the world. It starts at $1499 in the US and for that kind of money you’re getting 16 GB of RAM, a 128 GB SATA SSD and a 1 TB 7200 rpm HDD, while other configurations might include a larger and faster SSD. Personally, I’d just look at the base model and upgrade the SSD and HDD myself, since you’ll end up paying less, gives you the flexibility to put the exact drives you want inside and it’s a simple task that won’t void warranty, despite what that sticker on the back says. The base configuration I could find in Europe at the time of this post includes 16 GB of RAM, a 256 GB SSD and the 1 TB HDD for €1799. You can follow this link for updated details on configurations and prices at the time you’re reading this article, as well as user reviews from those who already bought the laptop and left their impressions online. 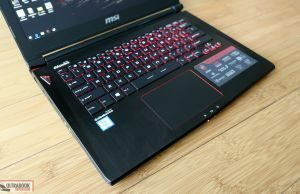 To wrap this up, if you’re looking for a compact and light computer with a powerful processor, modern graphics and fast RAM and storage, the MSI GS43 is for sure one of the options to consider. It looks nice, it works great with both daily tasks and demanding chores, it packs a decent screen and offers fairly good battery life considering the hardware and its size. 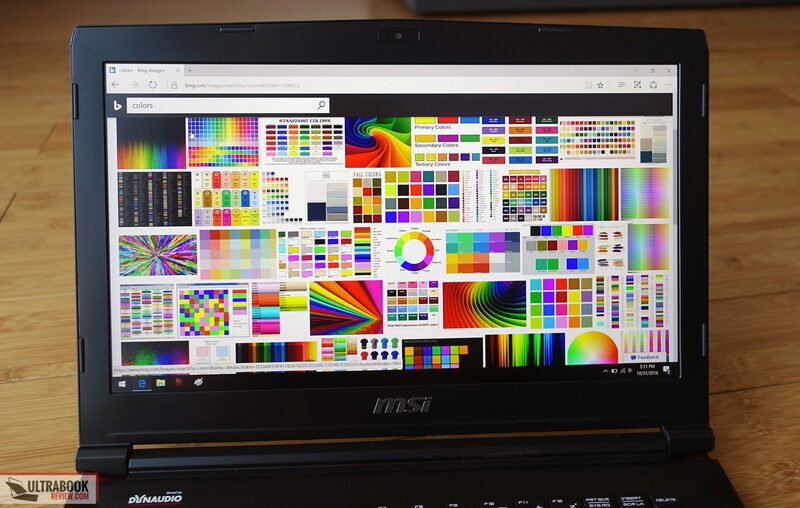 However, I do think it requires tweaking in order to get the most out of it, like getting rid of the bloatware (improves performance and battery life), replacing the HDD with an SSD (makes daily use quieter) and even repasting the CPU and GPU (lowers temperatures under load), so this is not the kind of notebook that works flawlessly out of the box. 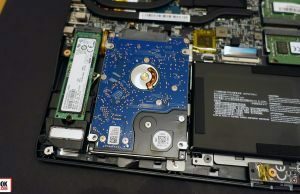 Besides this, you must be aware that squeezing powerful hardware in a thin body translates in high temperatures under load and a noisy cooling system that tries to keep them at bay. On top of these, the speakers are just horrible on this laptop and its keyboard and trackpad could use an update, as they’re not on par with what MSI offers on the larger Phantom Pros or what the competition puts on their devices. 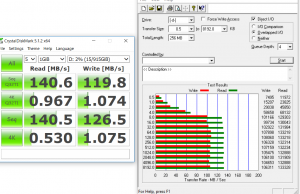 When it comes to 14-inchers, the alternatives are the Razer Blade 14 and the Gigabyte Aero 14, both great units, yet both with their share of strong and weak points. 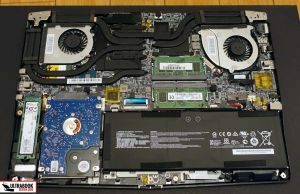 You’ll find more about the Aero 14 by following this link , and you can read what we think about the Blade 14 in this review. 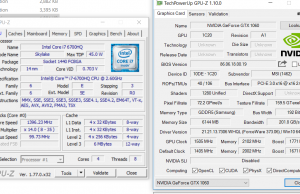 Even with those two 14-inchers, I do feel the best alternative for the GS43 is MSI’s GS63 model, and that’s because it addresses most of this 14-incher’s issues. It gets a better keyboard and trackpad, way better speakers, it’s just a tad bigger, but thinner and lighter at the same time, and offers a few different screen options to choose from. It still gets hot and noisy under load, but that’s just something you’ll have to accept on any gaming ultraportable. 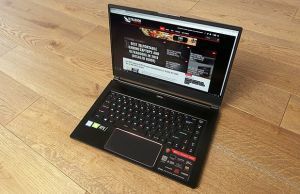 The MSI GS63 is more expensive though, starting at $1699, and that alone might turn you away from it. 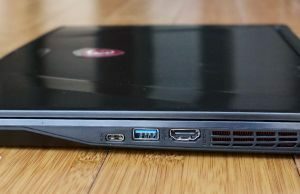 At the end of the day though, I think the MSI GS43 can be a good buy as long as you really want a 14-inch computer and you’re aware of its shortcomings. 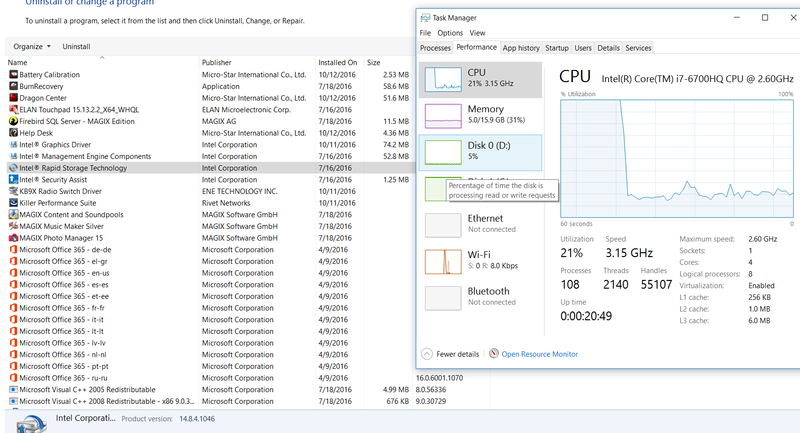 Just do a clean Windows install to get rid of all the bloatware (I just can’t stress this enough) and replace the spinning HDD with an SSD, that’s going to make your daily life with this computer so much more pleasant. 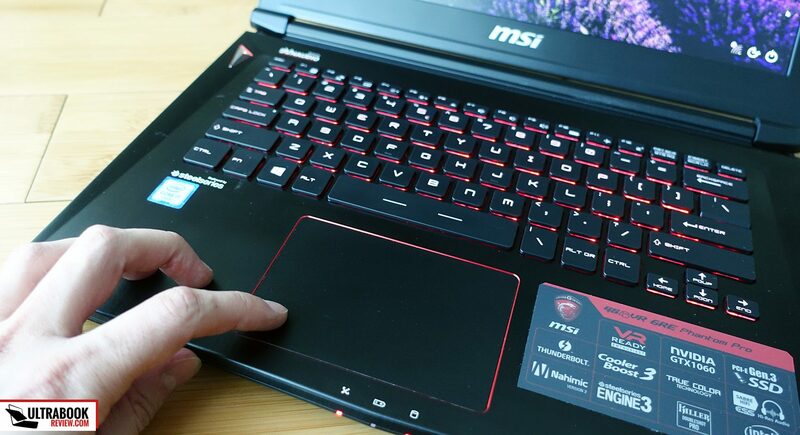 However, I still think the 15-inch MSI GS63 is an overall superior pick for those looking at a thin and light gaming machine and is worth paying extra for. If neither of these rub you the right way though you should also check out our dedicated article on gaming ultraportables or our list of portable laptops with Nvidia 1060 graphics chips for more suggestions. 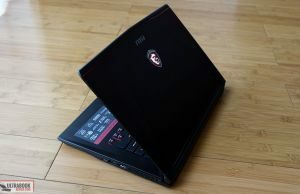 Anyway, that’s about all I had to say about the MSI GS43VR Phantom Pro. Feel free to add your opinions or any questions you might have in the comments section below, we’re around and ready to help you out. 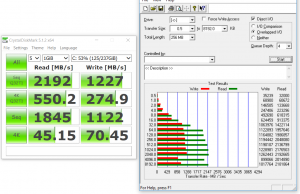 Can you show step by step how to change the HD to SSD ? Like a short video or step by step pictures, or any other link you can provide. 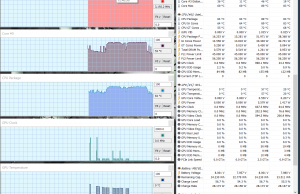 I want to upgrade from the spinning HD to an SSD. I no longer have the laptop around, but it's just a matter of unscrewing the back and you'll find the M.2 slots and the 2.5" storage bay. There are pictures in the post of the internals. I am thinking about getting the 7RE version of this once it is out. 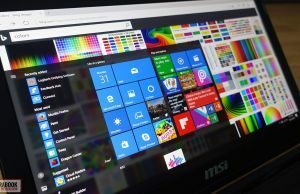 How do you fresh install windows with it? Does it come with a way to install just windows? 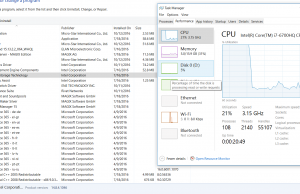 You download a tool from microsoft to create an installation for another computer and make a USB installation. 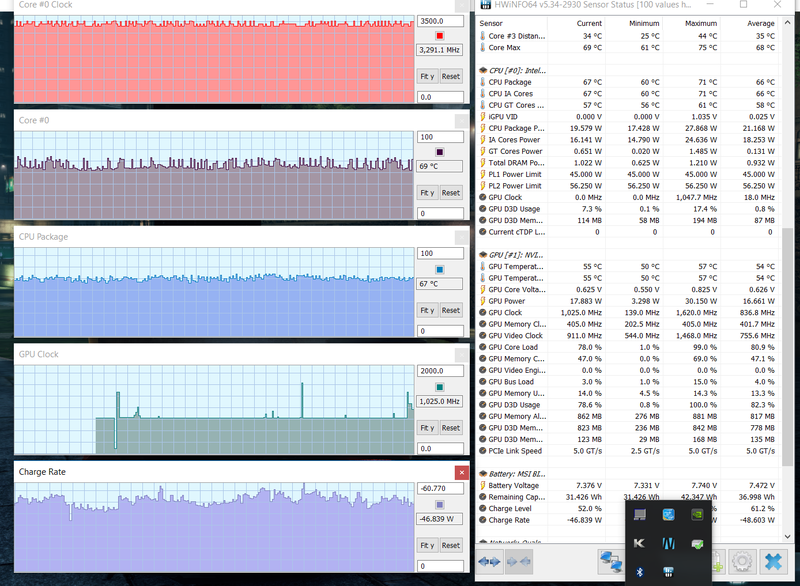 Windows 10 home x64. 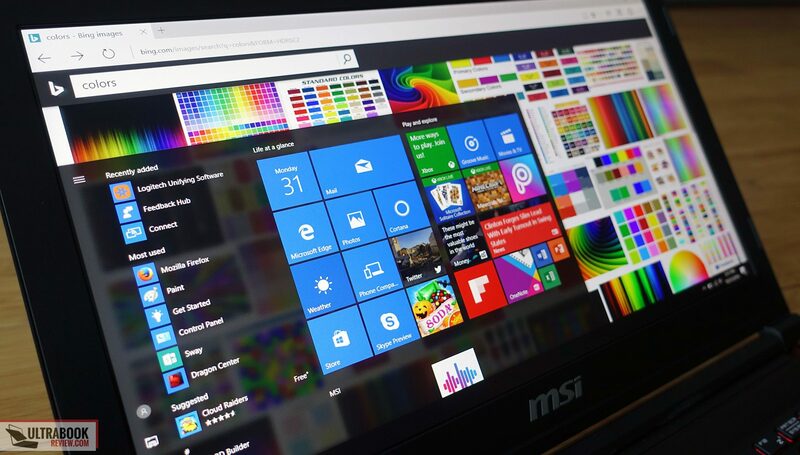 Once you activate the laptop with the original setup, you can reinstall windows 10 home x64 without worries, it will automatically be activated. then download and copy the intel rst floppy driver image and put on the usb drive with the windows installation. 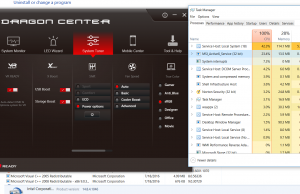 you will need to load the driver to see the pcie nvme drive during installation. 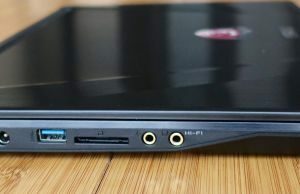 I can also say the laptop comes with 2 speakers, just that they look different, the silver thing under the SSD is a speaker. However 2 tiny speakers don't make for decent sound in a laptop of this size. Just basic audio. 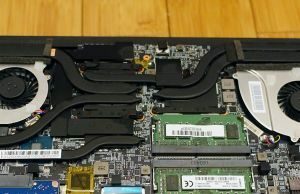 Just a heads-up about replacing the HDD with an SSD: while you're at it, remove the NVMe or the SATA SSD could get into thermal throttling. 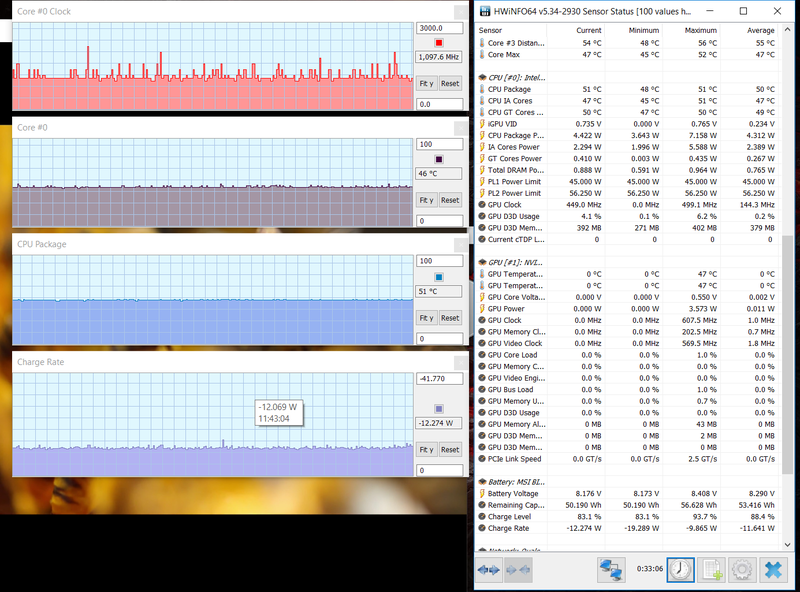 That's what I got with a 750GB MX300 (30MB/s on large files). 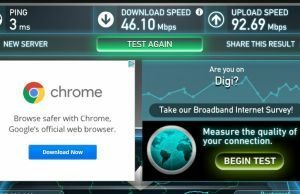 The NVMe is a consistent hotspot. 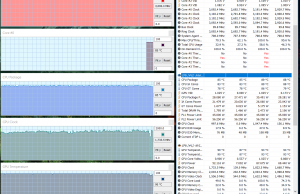 As a second benefit, under linux and 5 or 10% brightness (don't recall), with both drives present (MX300 and NVMe) it would consume ~11W in idle (and nvidia prime set to intel). 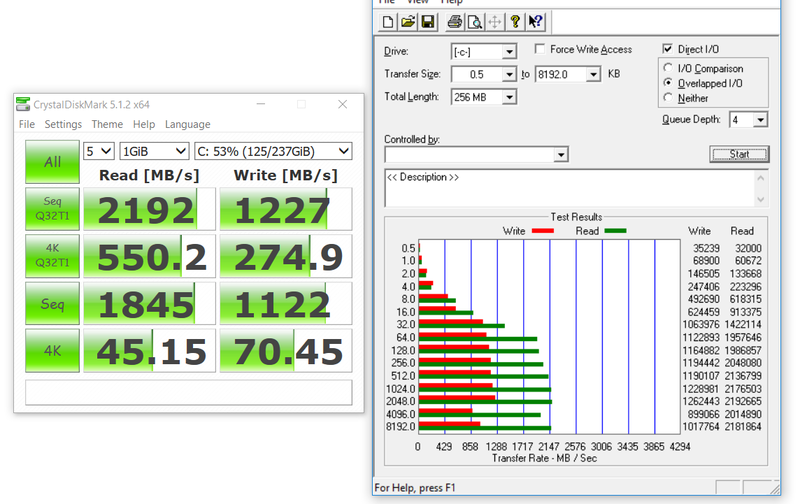 After removing the NVMe, consumption dropped to 8W. 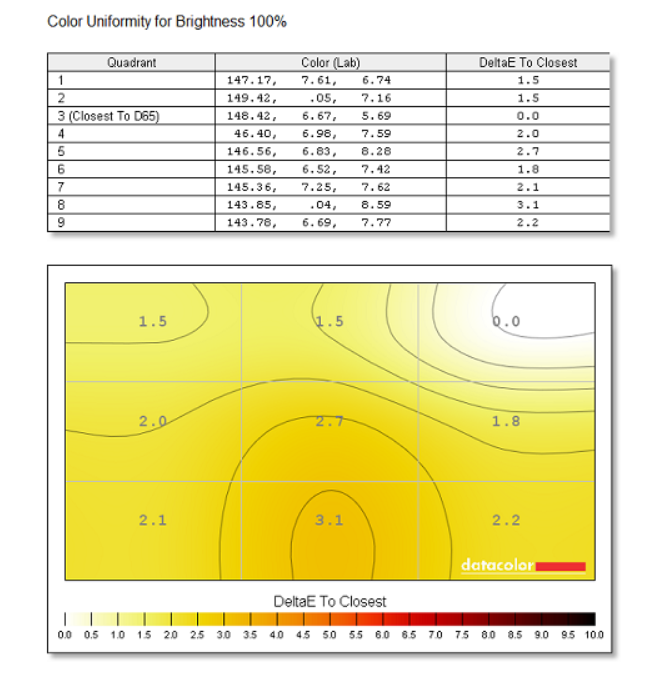 Did not test under light load, as I did not search for a consistent test.